Momento D’Oro Extra Dry - Full of Italian elegance and uncompromising quality of lively and refreshing bubbles with crisp fruity notes. 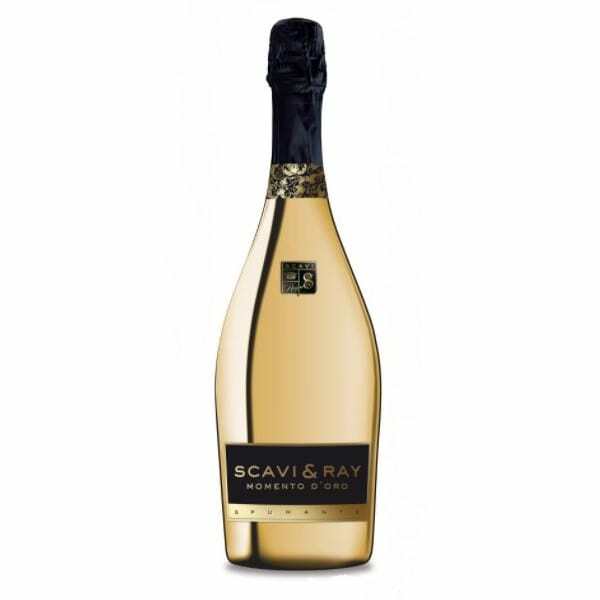 Scavi & Ray wine one of “Italy’s premium wines” from the Scavi & Ray Winery of northern Veneto and is the umbrella brand for Italian premium wines, typified by elegant design and outstanding grape quality cultivated in breath taking sun-drenched landscape with perfect soil conditions. The grapes are harvested by hand with tradition, passion and diligence. Joe Scavi and Carluccio Ray set out to make their dream come true and took off from New York to their fathers’ homeland in the province of Treviso in the Veneto region of Italy and stumbled upon a property planted with old vines laden with the late-maturing white grapes known as Prosecco. Markus del Monego world champion sommellier of 1998 and master of wine works with the Scavi & Ray winemakers to ensure the finest crafted taste.